It may not be quite what you think. Karlee Gould explores the idea that Government buildings will soon be empty by looking at the rate of technology development. The article takes a snapshot of the typical in-house models and the recent move to outsourcing all IT as services instead. I’ll start by openly suggesting that Governmental organisations are like all businesses. They are finding their way. And just like the rest of us, I know some of them still have relatively ancient technologies busily cranking around in the background, making the whole operation work. In the IT industry, I frequently encounter those who use very old programs and hardware and simply attempt to modify them to keep up with the ever changing rate of technology. They might bolt something else on to a system to upgrade it or replace a few parts and pieces. On occasion they’ll replace an entire piece of equipment, to make sure they’re not completely embarrassed by them, much to their expense. 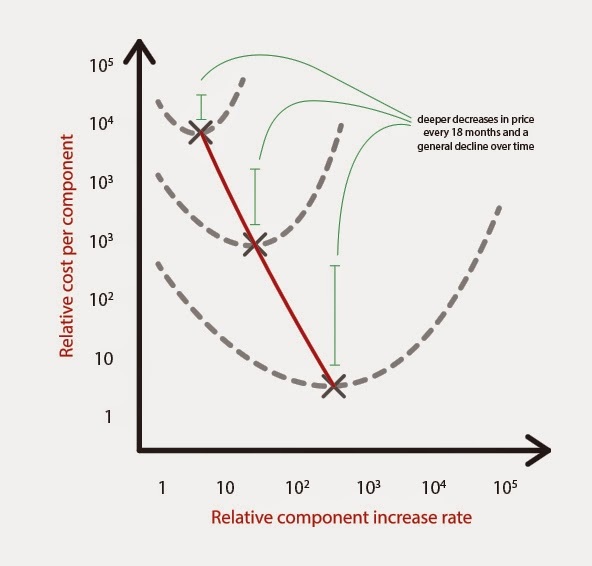 In basic terms, Moore’s Law starts by looking at when the doubling of transistors in a CPU occurs and focuses on the trend in which hardware + time has ultimately seen the devaluation of technology itself. The interesting bit is the speed at which technology is developing. It applies a metric to this equation which is ultimately crashing the value of technology very quickly. The rate at which transistors double in a CPU is every 18 months according to the ‘Law’ – an unprecedented rate which is predicted will soon have a limit, however it is envisioned that engineers will find a work around to keep up with the intense increase in complexity of components for computing hardware. So, very simplified: if you take a brand new piece of equipment, apply only 18 months to it, its monetary worth will be half what it was, even if it’s still brand new. The new version will be double its capacity, and will cost the same or less as the previous model did at its conception. This is the essence of Moores Law in a basic nutshell. Because technology is progressing at this rate, we see things in our technical age that those a handful of years ago would have felt were completely impossible, and a little too ‘Meet the Jetsons’ to stomach. At the current rate, we have seen our mobile phones overtake the computing power that was essential to put a man on the moon in just under 60 years. Would you have ever thought back then that moon-rocket power would fit in your back pocket and cost so little? We see this all around us every day - like when we pick up a Blu-ray player for less than a box of chocolates or install a great home cinema system and spend more on a chair to sit in and view it. Now take all that knowledge and apply it to the in-house technologies Governmental bodies (up until recently) employed routinely, such as servers and networking, in-house data farms, dedicated hardware to telephony or video conferencing infrastructures and other such communicative technologies which require constant physical maintenance and updates in security, etc, etc - you get the point. Add the data consumption and processing power and there’s a recipe for needless spend and a never ending cycle of hardware. Frankly, everyone was doing it. The difference now is that the benefits of abandoning this model have been put fully in to focus. It’s been realised that technology installed today will, in less than three years, be completely obsolete. When adding the impending data overload to this as well, you can imagine how quickly outsourcing these technologies (as cloud-based services) instead would be much more attractive to everyone, let alone Governmental bodies. Well, it has become evident that Government purchasing systems certainly see this attraction and have sought new ways of purchasing IT in search of something more sustainable. The move in to purchasing IT services not only allows large organisations to deploy technologies faster, it allows them to quickly upgrade or move on to something new, when they feel necessary, to accommodate their growing demands and needs without blowing their budgets. With these services readily available, high security mobility can be put to great use. Soon, I would expect to not only see an absence of technology infrastructure and hardware within Governmental buildings, I also believe the staff will barely inhabit them either. This is because once a cloud-based service is deployed, it can be accessed from any point, encouraging mobility in the workplace. Essentially, most ‘work’ buildings will be quite unnecessary due to staff naturally migrating to mobile device use. The benefits of going purely cloud-based usually includes high quality maintenance and support within the service packages, reducing overall employment costs as well as the equipment itself, so hosting technology in-house becomes even less attractive. Put simply, the bodies deciding not to jump on this band wagon will be left well behind. Eventually, they will absolutely have to make that move regardless, to keep up with advancing fellow Governmental bodies who have freed up their resources and are fulfilling their needs to remain progressive at all times. Once Mobility and Services become common place, organisations will feel the freedom from the constraints that once came with static hardware. My estimate is that Governments and several pan-Governmental bodies will eventually be totally on the cloud and will no longer feel the confines of old IT, or the tall physical walls they were once kept in. Since the world is shrinking, it’s probably better we do away with such huge buildings anyway.